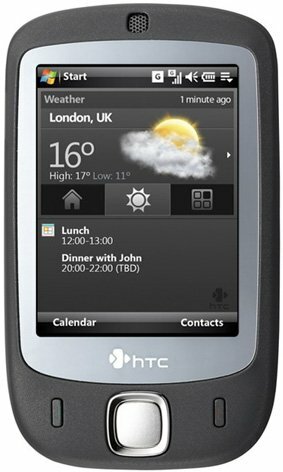 Melding the power of Windows Mobile 6 with an innovative touchscreen navigation interface, HTC's Touch is a deceptively small and stylish mobile phone that brings together email and other essential business applications along with excellent multimedia capabilities. You'll also effortlessly stay connected to all your personal and business contacts--send and receive email from accounts like Hotmail and Yahoo!, chat on Messenger, and send photos to your own Web space through Windows Live. With an upward swipe of your finger, use the TouchFLO 3D cube navigation to access entertainment, communication tools, and a "top 9 dial-by-picture" screen. 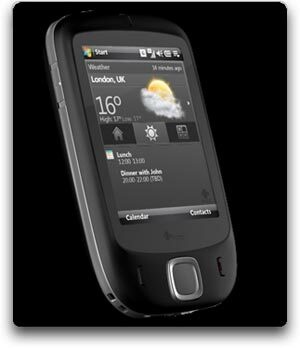 Leveraging the broad functionality of Windows Mobile 6 Professional (for touchscreens), the HTC Touch includes Outlook Mobile, Office Mobile and the capabilities to run thousands of third-party applications. Nicely compact at just 0.54 inches thin and 4 ounces, the HTC Touch also features a 2.0-megapixel camera/camcorder, Wi-Fi networking (802.11b/g), fast Bluetooth 2.0+EDR with stereo music streaming profile, MicroSD expansion, digital audio and video player, and speedy downloads via the EDGE data network. This unlocked cell phone can be used with a GSM network service provider and it provides tri-band connectivity (900/1800/1900 MHz). It does not come with a SIM card, and it requires that you provide a SIM card for usage with your selected service provider. This phone does not include a warranty. With a nearly 3-inch display, the HTC Touch's navigation is powered by TouchFLO technology--new underlying touch screen technology developed by HTC--which provides smooth navigation through menus with a finger swipe. Simply sweep your finger up the display to launch an animated, three-dimensional interface comprising three screens: Contacts, Media and Applications. In addition, the innovative TouchFLO cube brings a 3D cube interface allowing quick access to entertainment, communication tools and a "dial-by-picture" photo caller ID screen. It is intelligent enough to distinguish between finger and input via the included stylus and then respond accordingly. The new HTC-designed home screen provides one-touch access to emails, text messages, calendar appointments and contacts, as well as current weather conditions and forecasts for hundreds of cities around the world. Since you'll be accessing most functions via the touchscreen, it includes only buttons for a cursor pad, send and end, camera, and volume rocker. 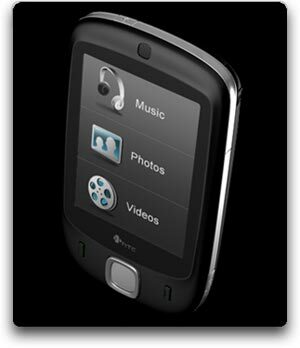 In addition to real-time synchronization with Microsoft Exchange via Windows Mobile's Direct Push Technology, the HTC Touch is also loaded with instant messaging capabilities for Windows Live Messenger. The Touch also enables sending of SMS and MMS messages, and it includes XT9 predictive text entry (the new version of the T9), with Key features including a word prediction list and spelling correction which spots transposed letters and missed keys, as well as instant integration into all applications on the device. The phone's contact list is limited only by available memory, and you can store up to 12 numbers per entry as well as home/work addresses, email, IM name, birthday, and more. You can load up your MP3 files on optional MicroSD cards (up to 4 GB in size) via a USB connection from your PC, or download music from the Sprint Music Store. The integrated Windows Media Player Mobile allows you to play your favorite music, videos and more while you're on the go, and it synchs music seamlessly with Windows Media Player on a Windows-based computer. This phone provides Bluetooth version 2.0 + EDR (enhanced data rate) wireless connectivity, and includes profiles for communication headset, handsfree car kits, object push, file transfer, audio/video remote control, and basic printing. With the A2DP Bluetooth profile, you can stream your music to a pair of compatible Bluetooth stereo headphones. You can connect your laptop (either via Bluetooth or wired USB) and enjoy dial-up networking--surf the Internet, send email, and access files from a server. Send contacts, calendar events, and pictures/videos/voice memos wirelessly. You'll also be able to access open Wi-Fi networks in offices and hotspots via the integrated 802.11b/g wireless connectivity. 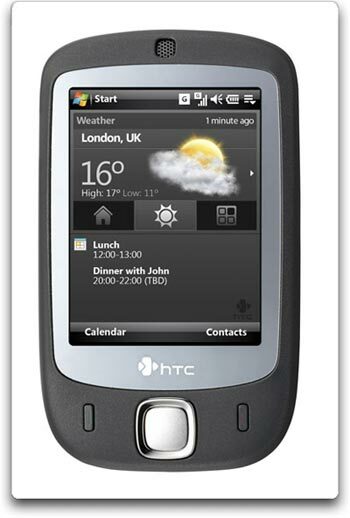 The HTC weighs 4 ounces and measures 3.93 x 2.28 x 0.54 inches. Its 100 mAh lithium-ion battery is rated at up to 5 hours of talk time, and up to 200 hours of standby time. It runs on the 900/1800/1900 MHz GSM/GPRS/EDGE frequencies. 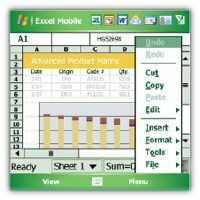 Microsoft's Windows Mobile 6 updates the Windows Mobile 5 platform with a number of handy features that make searching through email, editing Microsoft Office documents, and staying on top of your most important communications even easier. Emails can now be viewed in their original rich HTML format and now offer the ability to visit embedded links. It also includes Windows Live for Windows Mobile, which provides a full set of Windows Live services, such as the Windows Live Messenger IM application, which now enables you to chat with more than one person at one time or send a file. Windows Mobile 6 adds power to your mobile office with up-to-date e-mail delivery and automatic synchronization of Outlook calendars. 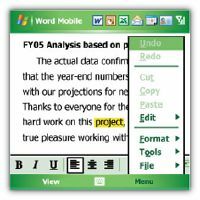 Edit Word documents and Excel spreadsheets on your phone, just as you would on your desktop/laptop PC. With Excel Mobile, you're not just confined to editing charts: with the new Chart Wizard you can create charts quickly and easily. All Windows Mobile 6 powered devices include Direct Push Technology for up-to-date e-mail delivery and automatic synchronization of Outlook calendars, tasks and contacts through Microsoft Exchange Server. It also offers a set of important device security and management features that include the capability to remotely wipe all data from a device should it be lost or stolen, helping ensure that confidential information remains that way. This phone have menu in spanish ?